April 14-15 this year will mark the 100th anniversary of the sinking of the RMS Titanic - an historic event, the legend of which permeates our general knowledge to this day. It has been characterized as one of the greatest maritime disasters in history and the hundredth anniversary is being remembered with a flood of information about the subject, from historic investigations of the sinking on news websites and in magazines to the re-release of a big-budget Hollywood film - this time in 3-D.
At the Clarke Historical Library, we are also marking the 100th anniversary of the Titanic sinking by reflecting on the coverage provided in local newspapers and highlighting some of the historic resources that we make available to researchers across the world. 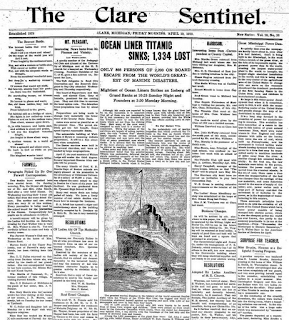 One of many local newspapers that reported the Titanic tragedy was the Clare Sentinel. 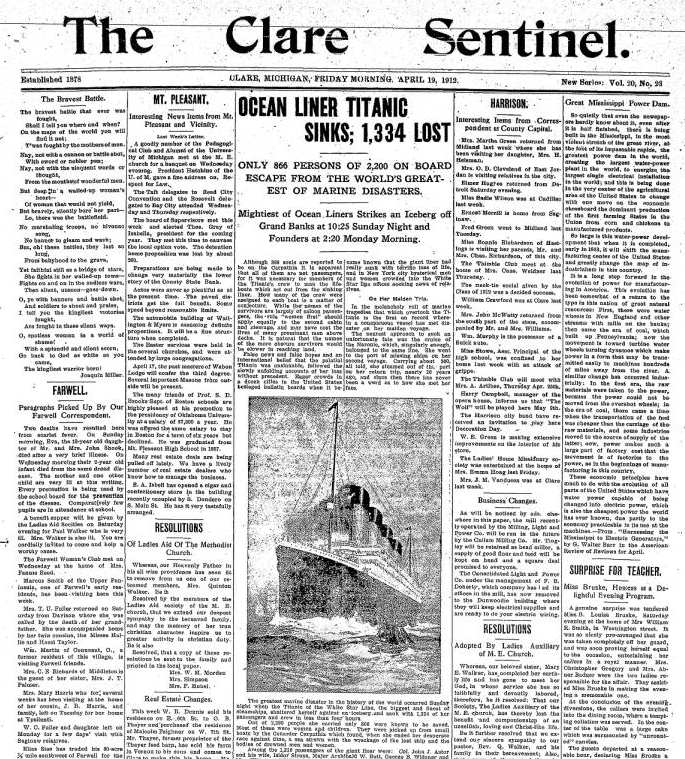 The April 19, 1912 edition of the Clare Sentinel features the story of the ill-fated ocean liner front-and-center with stories of local happenings in Mt. Pleasant, Harrison, and Farwell. The first bit of information mentioned in this report concerns the number of survivors and why the survivors would include men and some of the crew members, commenting on the fact that "women and children first" was not followed 100%, but was the general rule. 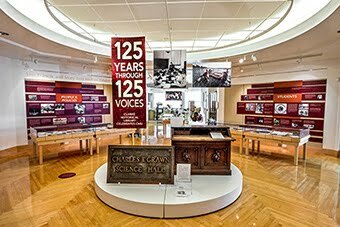 Besides this edition, the Clarke has thousands of reels of historic newspapers available on microfilm for researchers to use - but that is not all. In addition to making historic newspapers available in microfilm format, this edition of the Clare Sentinel and the entire run from 1896 to 1945 has been made available in a digital format via CONDOR. You can view the entire April 19, 1912 edition of the paper by clicking on this link. There are also numerous other historic and contemporary resources made available on CONDOR, including Central Michigan Life (currently 1968-98, but it is always expanding), the Chippewa Yearbook, CMU Board of Trustees Minutes, historic local newspapers, and select titles from the Clarke Historical Library and Park Library holdings. CONDOR, an effort of the Clarke Historical Library, the Park Library, and Central Michigan University as a whole, is a institutional repository or “a permanent, safe, and accessible collection of the academic and intellectual output of the CMU community.” The CONDOR homepage can be accessed via this URL - http://condor.cmich.edu/cdm/. If you have any questions about the functionality of CONDOR or any of the web resources that the Clarke Historical Library makes available, or if you would like to see other historic newspapers that are not yet available in a digital format, please feel free to contact us for more information - clarke@cmich.edu. Stay tuned for a future post about the reaction to the sinking of the Titanic by a former Michigan Senator.